As well as sharp points, many plants, such as the Acacia tree, will produce toxins as a defense mechanism to deter wildlife. To protect themselves from being consumed, many plants produce toxins or secondary chemicals that may be toxic to some organisms, including pond fish. For example, acacia trees in Africa produce a compound called tannin, which is moderately toxic to organisms, including giraffes (the main browser of acacia trees, due to their long necks). In fact, upon being munched on, the leaves of acacia trees will emit warning pheromones (ethylene gas, specifically) to any trees downwind, alerting them to start producing tannins as well. Many other plants, including those possibly around your pond, have similar defense mechanisms in place. Some plants simply have poisonous leaves, berries, or root systems. 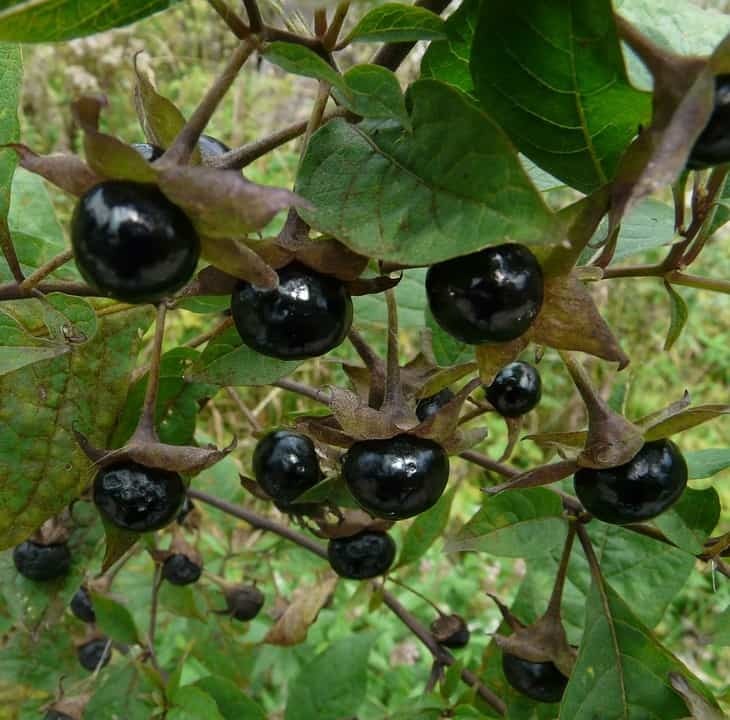 Others, like Deadly Nightshade, are almost entirely toxic. Some may only have poisonous leaves, others may only possess toxic compounds in the roots, and others may be entirely toxic, leaves, shoots, roots, berries and all (nightshade, for example). Many are only toxic to certain organisms, like humans or dogs, and others are only toxic to fish (called ichthyotoxic) or insects, others may only impact other plants to reduce competition, and still others are poisonous to just about everything. 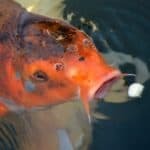 You certainly don’t want these sorts of plants in or near your koi, goldfish, or fish pond, as they could cause your fish to become ill, act oddly, disrupt metabolism, or even cause death in some extreme cases. Here we will list a variety of plant species, both terrestrial and aquatic, that are toxic to fish to aid you in deciding which plants to avoid planting around ponds. This list is by no means exhaustive, but rather covers some of the more common plants (with a few less common ones mixed in) that are often either naturally occurring or sought after for garden ponds. You should certainly conduct further research before incorporating any plant in or around your pond to ensure it’s safe for fish. While not actually a plant, it’s important to mention blue-green algae, also known as cyanobacteria, as it’s potentially quite harmful. As the names imply, blue-green algae is bluish green in color (cyan) and composed of bacteria, not algae, though it does closely resemble algae when it blooms out of control. Cyanobacteria contain a host of harmful toxins, and different species have different dangers. While the presence of some cyanobacteria is natural and even beneficial (as covered in our article on the different types of algae), if a cyanobacteria bloom occurs it can cause muscle degeneration, oxygen depletion (and asphyxiation as a result), damage the internal organs such as the liver and kidneys in addition to damaging the gills, and ultimately can result in mass fish kills. However, the smaller the water body is, the easier it is to monitor and control blue-green algae. Simply conduct water quality tests on a daily basis to monitor nutrient levels, pH, dissolved oxygen levels, and so on. If your pond has low dissolved oxygen and high levels of nutrients such as nitrogen, you’re at risk for a cyanobacteria bloom. Simply return the water to normal, healthy parameters and the bacteria will be kept in check. Though naturally occurring around much of the world, oak species contain compounds known as tannins that, while they likely won’t cause death, they can cause digestive upset and reduced digestive rate. Specifically, the leaves and acorns of oaks contain tannins, and can make your fish sick if they fall into the pond where they are able to be consumed. As well as this, the acorns and leaves are prone to build-up and will cause issues with water condition if large quantities are left to decompose on the pond floor. With their ability to either be pruned into a shapely shrub (say, one that looks like an animal or statue, for instance) or trained into a mature tree with large swooping branches and fragrant needles, some pond owners enjoy having yews leaning over their water. However, the needles and seeds are both poisonous to fish due to taxine alkaloids, though interestingly enough the berries themselves are edible (so long as the seeds are not consumed). 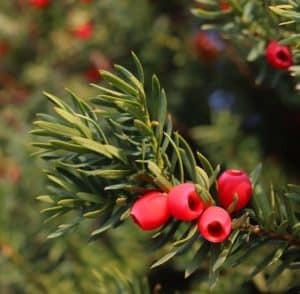 The Japanese yew (Taxus cuspidata) is particularly dangerous, as it’s also an invasive species in Europe and North America. Though cherry trees are certainly beautiful with their fragrant and vibrant blooms and bright fruit, be they wild black cherry, pin cherry, choke cherry, or modern cultivated cherry, all parts of them are considered toxic to fish. They belong to the rose family and are highly sought after by gardeners and enthusiasts alike for their appearance, scent, and edible (to humans!) fruit. However, all parts of cherry plants are toxic to fish, and the seeds (or pits) in particular contain hydrocyanic acid, also known as prussic acid. In larger animals, such as humans or livestock, these pits would have to be consumed in great quantities to have much effect. In fish, however, consuming just one or two pits could cause death. Hydrocyanic acid blocks the ability of tissues to use oxygen and ultimately results in suffocation, spasms, and death shortly after. Similar to cherries, peach pits also contain hydrocyanic acid. In fact, anything in the genus Prunus (also known as drupes or the stone fruits, named after their hard pits), should be avoided near your pond. This includes apricots, plums, nectarines, mangoes, and so on. All parts of peach trees are toxic to fish to varying degrees, though only the pits and the seed inside of them may cause death if nibbled on. The leaves, buds, etcetera have only been known to cause little to no effect. All portions of black walnut are toxic, except for the meaty walnuts themselves. The leaves, roots, bark, and walnut husks (also known as modified bracts) that surround the nut and its shell all contain something called juglone toxin, which incites cellular death in plants (making walnuts exceptional at killing off competing plants around them), insects, and small organisms like fish if the plant matter is consumed. The toxin is also leached into the soil via the root system, so if you’d like to have a walnut, plant it far away from your pond. Contrastingly, if you have an existing walnut tree and are looking to have a pond, place the pond far enough away from the walnut that it won’t pose a threat (there’s not much sense in cutting down a tree if you don’t have to that does have positive wildlife value and can provide you with food – the walnuts themselves are not toxic!). Typically occurring as flowering vines or shrubs, some jasmine varieties can also be evergreen. With their exotic, extremely sweet fragrance and attractive five-merous white flowers, placing jasmine by your pond can be tempting. However, the berries (and some argue the flowers as well) are dangerous to most wildlife and fish, causing disruption of the nervous system due to the presence of glycoside and hepatoxins. As might be expected from its name, all parts of nightshade are fatally toxic. Nightshade species are in the family Solanaceae, and in fact all members of this family should be avoided. They often have pretty and fragrant flowers and tasty-looking berries, but don’t be fooled – most types of nightshades are still considered dangerous to humans, livestock and fish alike. 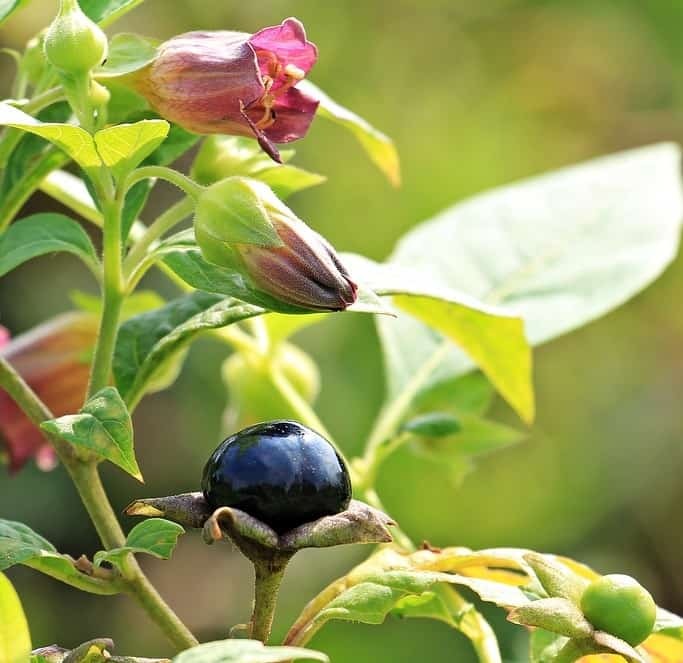 In particular, the infamous Atropa belladonna, or “deadly nightshade” (pictured), which is in the same family as potatoes, tomatoes, and eggplants, has berries which are extremely toxic to organisms if ingested. Alocasia are very large-leaved tropical to subtropical plants, also known as the jewel plant for the beautiful patterning on their leaves. They’re often used by gardeners and ponders alike, as they effortlessly provide a tropical feel and don’t require much care so long as your temperatures average above 60°F year round and they can get plenty of moisture either from the soil, rainfall, or supplemental watering. Their beautiful appearance aside, alocasia stems and leaves are toxic because they contain indigestible crystals of calcium oxalate, like taro mentioned below. Taro, also known as elephant ear, is a subtropical to tropical flowering plant with impressive leaves that can be larger than a person! You may be a bit surprised to find this plant on this list, as it’s sold by many pond plant sellers and has been incorporated into many pond scenes as they add a tropical, exotic vibe. However, all parts of the plant are toxic to fish (as well as humans, dogs, cats, and likely many other organisms) if ingested due to the presence of insoluble calcium oxalate acid. Some pond owners may argue this, as they’ve had the plant without issue. Regardless, we recommend staying on the safe side and not having this plant in close proximity with your pond, but at least far enough away that there’s no danger of leaves falling into the water and your fish nibbling on them. Wisteria is a beautiful, vigorous woody vine that can become a shrub or even trained to be a gorgeous viney tree. With dramatic, elegant drooping clusters of flowers that range from blue to purple to white to pink, wisteria can be quite tempting to add next to your pond as it provides a very magical feel. However, the flowers are known to be toxic to most animals, and so if it’s planted too close the flowers could either fall in or be blown in by wind if the plant is further away. The seeds are also toxic and can result in illness or death. Belonging to the legume family, most others in this family should also be avoided. Though an extremely beautiful and unique plant, the leaves of the bird of paradise (native to South Africa) contain tannins. These aren’t deadly, but can cause illness and discomfort if they’re allowed to build up. The seeds, however, contain hydrocyanic acid, and like cherry will result in suffocation and ultimately death if ingested. Try your best to keep these plants far from your pond, or even avoid them altogether if possible. A relatively common flower, as it’s both pretty and easy to grow (it’s able to grow in nature just fine on its own), tiger lilies should also be avoided. All parts of it contain Lycorine alkaloids, which don’t typically result in death unless ingested in large quantities, but most often cause nausea, convulsions, and inability to properly synthesize proteins in the body until the toxin has been diluted and exited the body. These symptoms have been reported in cats, dogs, and horses that have ingested Lycorine alkaloids via tiger lilies, daffodil bulbs, or other plants containing the alkaloids, and are likely to have similar effects on fish. With deep green, creeping vines that sport lively blooms that open up each morning, morning glories are often planted on trellises or near things that they can climb around. Because of this as well as their white, blue, purple, magenta (or any mixture thereof) flowers, they make quite a pretty addition to water scenes. The seeds of morning glories (and of most things in the Convolvulaceae family), however, contain a chemical quite similar to LSD, called “natural LSD”, that is harmful to just about anything that ingests it. If any part of the plant is consumed, you may notice your fish acting oddly (because the effects are similar to that of LSD), refusing to eat, and producing excess waste. An exceptionally pretty plant that grows several feet tall with showy, bell-shaped brightly colored flowers of all shades that are also uniquely patterned on the inside, foxgloves can be hard to resist, for they make a gorgeous addition wherever they are. With that being said, all parts of the plant are considered toxic to humans, dogs, deer, and fish alike (along with many other organisms) if the plant is in any way ingested. Consumption results in the heart rate slowing down dramatically or becoming irregular, and if too much is eaten then the heart can stop altogether. In fact, the cardiac and steroid glycosides present in foxglove act similar to medications used to treat tachycardia. You can plant it if you wish, but try your best to keep it away from your fish and any other pets! Are uk blue bells poisones to gold fish? I have a couple of floating planters in my fish pond. I would like something flowering but low growing. Are purslane, Vincas or Calibrachoas poisonous to goldfish? Again, this is just a single study representing just a few genera within the families, so it may not apply to your chosen species. However, I do know that these plants contain alkaloid compounds (most plants do; just to different degrees), which can indeed be toxic to fish, but they do need to be in high concentrations to cause serious harm. If your pond is fairly large and well maintained (i.e., good water quality), just a few floating planters are unlikely to cause major issues, especially if you make sure to clean away dropped foliage before it can leech into the pond water.